Our specialty at egf polo is polo team branding. We design and produce artwork to reflect your team or club image and realize it through team clothing, match shirts and pony accessories. From trucker caps to match shirts, lycra skins to pony rugs, we can help you - whatever your needs. Firm manufacturing links enable us to produce totally bespoke products to your specifications. Access to a huge range of 'off the shelf" garments allow us to respond quickly to last minute orders. Using the latest design software allows us to quickly develop complex designs and present them for approval before manufacture. We aim to satisfy our customers with team-wear that is unique and outstanding in both form and function. We recognise that your kit is not just a branding exercise, but technical sportswear, and a reflection of the team's personality – good team kit looks great, but also means something. 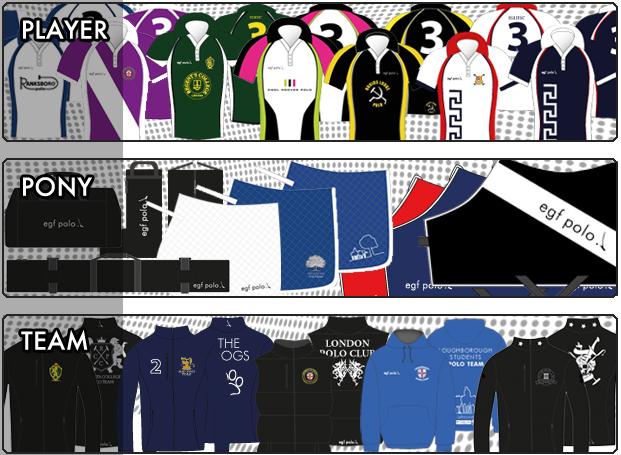 So if you're interested in having some kit made - whether it's a set of team shirts or a whole tour clothing range – then please contact us or email at info@egf-polo.co.uk.